Discussion in 'Events and Activities' started by Teresa, Mar 2, 2015. 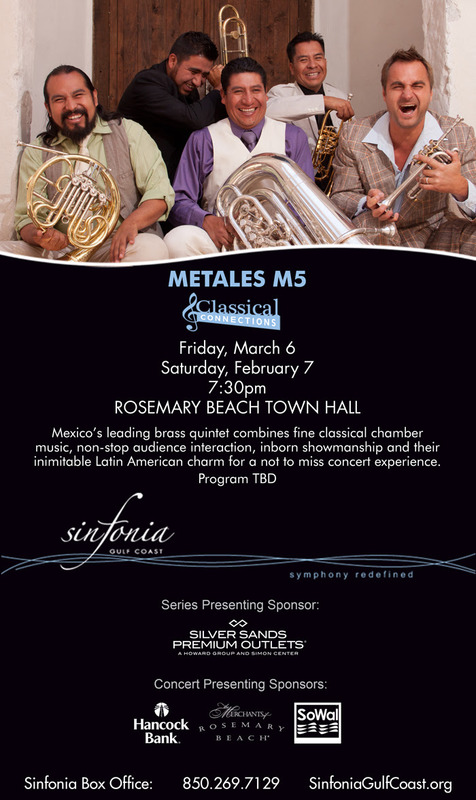 Mexico's leading brass quintet combines fine classical chamber music, non-stop audience interaction, inborn showmanship and their inimitable Latin American charm for a not to miss concert experience. The intimate setting of Rosemary Beach Town Hall is the perfect venue for these performances, which will feature the works of Bernstein, Mozart, Piazzolla plus more. Only a few tix left for Friday night's performance at Rosemary Beach Townhall. Purchase tickets online!